The Lady Rockets Softball Team completed an outstanding season by defeating Abilene in a tough 1-0 contest to bring home the State 3rd Place trophy. Freshman Tori Beltz had the big hit in the 6th inning to score Courtney Rash from second base. This was another pitcher's dual and Keelyn Bonar again threw a great game. In the Semifinal contest earlier in the day, the Rockets could not produce any offense against Riverton in a 4-0 loss that also saw the Rockets make 4 errors in the game. The Rockets easily handeled the Quarterfinal game against KC Ward on Friday by a 6-1 decision. The Lady Rockets completed the season with an outstanding 23-3 record with a team consisting of all underclassmen starters. 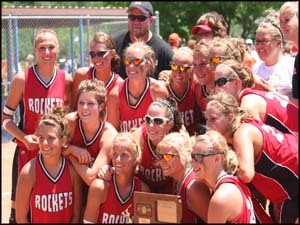 The leadership of Seniors Caitlin Maples and Taylor Clark will be missed but 2010 should provide for a very exciting season as the Rockets will try and improve upon their 3rd Place State finish. The Lady Rockets saw their season come to an end in the Quarterfinal round of the State Playoffs with a 5-3 loss to a very athletic Topeka Hayden team. The Wildcats got out to a fast start as they quickly built a 3-0 lead early in the first half. The Lady Rockets, however, kept fighting and with 2 goals from Hull and another from Koeppe narrowed the Wildcats lead to 4-3 with over ten minutes still remaining in the game. Unfortunately, the Lady Rocket comeback would stall at that point. The Wildcats scored their last goal with just under 5 minutes remaining in the game. 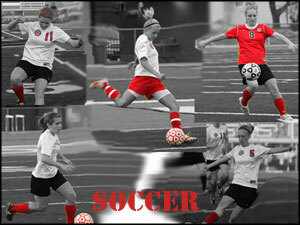 Congratulations to the Lady Rockets for an outstanding season in which they finished with a record of 14-2-2. The Lady Rockets will now look to reload next year after losing a very good senior class that includes Becca Yoder, Kelli Herbel, Miranda Fisher, Lindsay Rollins, Elise Terrell, and Kristy Herman. Baseball Season Ends in Semi's. The baseball team wanted nothing more than to return to state for their second season in a row. But it wouldn't be an easy accomplishment. Coming in as a 5 seed, the Rockets were set up against 20-1 Wichita Independent who hailed as a one seed. Starting off swinging, the Rockets bumped out early to a 3 to nothing lead. They would again score in the 3rd for the 4-0 advantage. Independent really got things going, however, sending home 5 runners in the bottom of the 3rd. Down by 1 run, the Rockets tied the game in the 5th, but Independent always had an answer as they scored 2 runs later that inning. Trailing 5-7, the Rockets really needed to get things going to keep their season alive. Unfortunately, they never could manage, and Independent would go on to win in a heartbreaking, season ending loss for the Rockets. 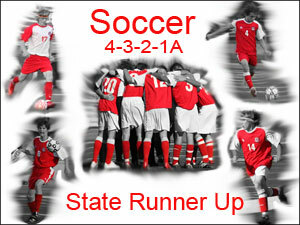 They have had a phenomenal season and a great run but their efforts were cut short. The Lady Rocket basketball team had quite the year finishing 18-6. The Rockets starting off the season at a top ranked #1 seed, but hitting a mid-season rode bump would knocked them off the top spot. Despite the few losses, the Rockets proved to be one of the top teams in the state capping a big victory over Andover in the Sub-State Finals to earn them a state bid in Salina. 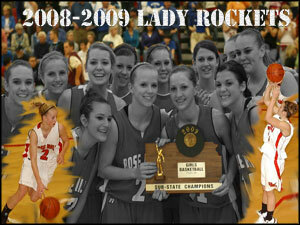 Making it to state has been rare for the Lady Rockets as this year was their first appearance in 18 years. In Salina, the Rockets fought and scrapped against the Paola Panthers. Holding on, the Rockets trailed two at half but the Panthers would increase that lead and the Rockets season would come to an end. The Ladies had a tremendous season being honored as League champions and Sub-State champions. Senior Starters Kristy Herman and Kelli Herbel were a great part of the team and their efforts will be missed next year. Other Seniors that were with the program: Kelli Coates, Ashley Green, and Jai Strickler, have stuck with the team through its ups and downs and their dedication and hard work will be missed. 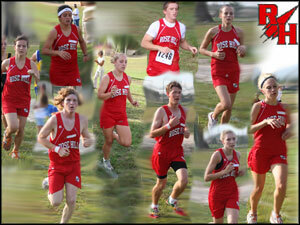 The Rockets have some big shoes to fill for next year in their hopes to make it to state again. The Rocket boy's basketball team seemed tough to stop when they put all the ingredients together. Finishing with a 15-8 record, the Rockets tied for 2nd place in the AVCTL Division IV league and Finished as Sub-State Runner-Ups after losing to Wichita Trinity. The Rockets had great tournament success throughout the season, they finished 1st in the Pre-Season tournament in Innman, and they earned silver in the Adolf Rupp tournament after a 2 point loss to Haven. The Rockets were led by leading scorer, Caleb Brown who averaged about 16 points per game. Caleb was a verbal leader for the Rockets this season and his leadership will be missed next year. Senior post Steven Walton improved his game towards the end of the season having impressive performances in the paint, and Senior Kenny Bates for the Rockets stepped in and hit some big three's for the team. 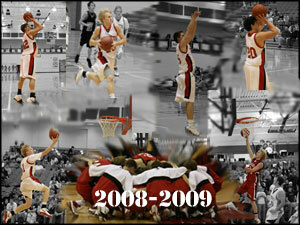 All the seniors will be missed next year and their shoes will be tough to fill in the 2009-2010 season. Caleb Brown and Junior Tyler Shirley were named on the All-League 1st team along with All-State honorable mention for their performances this season. Dillon Rapp and Sam Newton were named All-League Honorable Mention and will both need to improve even more for next year. The Rose Hill Rocket Wrestling team started the year with many young and inexperienced members, but throughout the year the team matured together and became better wrestlers. 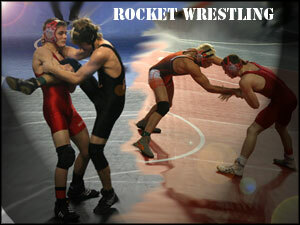 Leading the way for the Rockets through the year was Junior Zac Sparr in the 119 weight class. Sparr would finish the year with the most wins on the team and capture 3rd place at the state tournament. Along with Sparr, many other Wrestlers stepped up their performance during the season. Dustin Smades and Tyler Wilson each had a great year and Smades would go onto to Salina to compete at State. Key injury's hurt the Rockets as well. Senior Adam Weiss was unable to wrestle the whole season and Stewart Firebaugh was out half the season as well. As a team the Rockets were building with the young talent they had, and next year the Rockets will be stronger and more experienced to take on the challenges. The Seniors contributed greatly to the squad providing leadership to the team. All the seniors will be missed next season. The Men's Soccer team had a phenomenal season breaking out 9-0 before encountering their first loss to Trinity who eventually took 3rd place in State. Immediately after the loss, the Rockets bounced back and thrashed teams game in and game out. Nearing post season play, the Rockets turned up the intensity and shut out both Augusta and Buhler. In the State Quarter final game, the Rockets gave their season a scare when they saw themselves down 0-3 to Berean at half. They recovered and took it back at them, scoring five unanswered goals. The State Semi-Finals would be a battle as the Rockets came away victorious 1-0. Unfortunately the Rockets would lose in the State title game, but they have nothing to hang their heads on as they put together a outstanding season. The Rockets managed 13 shutouts and outscored their opponents 101-16 on the season. The Rockets will graduate four seniors from this years State Runner-up squad, including: Dylan Simmons, Austin Walls, Jakob Kriwet, and Kyle James. They played a big role in the Rockets success and will be remembered for their accomplishments. The Rose Hill Rocket Football team set their goals high for the 2008 Season. Returning a few starters from last year, the Rockets set off on a great foot winning their first four games of the season. Their first true challenge would come against the Clearwater Indians, but the Rockets would prevail with a 25-20 victory. Losing two back-to-back games after that, the Rockets didn't let that put their season in the dumps. 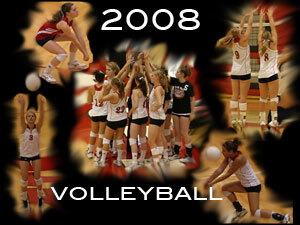 They bounced back in districts against Wichita Trinity, but lost the following game to Andover Central. With the season on the line the Rockets battled their hearts out against the Wildcats of Mulvane. Many players stepped up and made big plays but the Rockets would fall in a heartbreaker as the Wildcats completed a hail mary pass in the last seconds of the game to end the Rocket season. The team has nothing to hang their heads about as they finished with a winning season at a 5-4 record. The Seniors contributed greatly to the team and stepped up when needed. 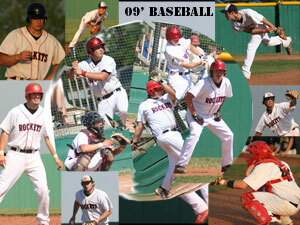 All the seniors will be missed in the upcoming 2009 season. The Rocket Volleyball team began their Sub-State tournament play Saturday against Wichita-Independent. With the season on the line, the team played well in game one never giving up the lead after a 6-6 tie and winning with a score of 25-23. However, game two was a different story. The Rockets jumped out to a 9-2 lead before falling behind 14-15 and eventually losing 15-25. The third and deciding game was a back-and-forth battled tied at 5 a piece when an crucial injury to Courtney Louia threw the Rockets off balance. After falling behind 7-16, the team fought back and closed the gap to 17-20 before losing 18-25. The team had its year full of its ups and downs as they at times seemed unstoppable. Finishing the season with an overall record of 15-20, the Rockets will lose only one senior, Kelli Coates, as she will be missed in next years squad. The team will train during the off season, looking to do good things next year with a lot of experienced returners.